I’m almost embarrassed to even have this as a post because it’s so easy to make. But had to include it as it’s delicious and a great substitute for the often inflammatory, gluten version we’re accustomed to. Slice 1 spaghetti squash lengthwise. Discard the seeds with a spoon. Fill a baking pan with 1/2” water and place the two squash halves faced down in the pan. Bake for 35-40 minutes until the squash is soft to the touch. In the meantime brown 3-4 sausages on medium high heat, until cooked all the way through or about 5-7 minutes on each side. Warm the spaghetti sauce over a low-medium heat in a saucepan until bubbling hot. Cool the squash for at least 10 min before trying to handle it. 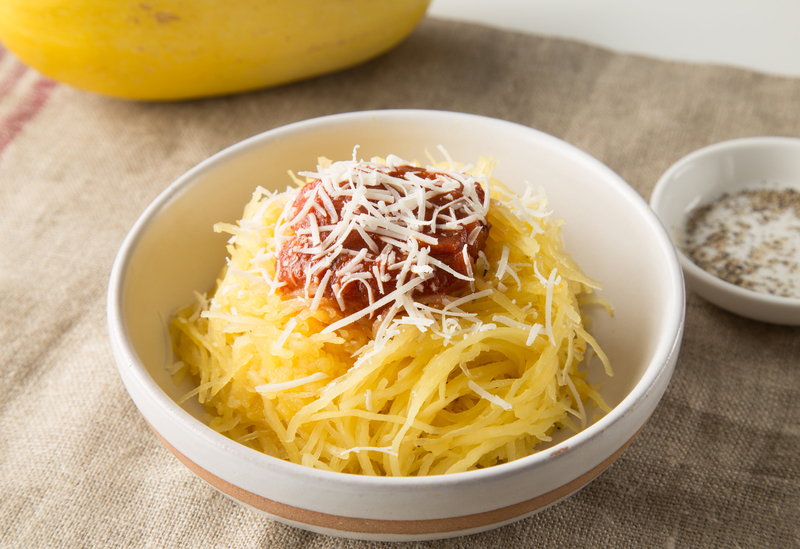 Once cooled, turn over and scrape the inside of squash lengthwise to get your grain-free spaghetti noodles! Top with butter, sausage, sauce, and Parmesan cheese (optional and not Paleo), and chopped fresh basil. This completely grain-free dinner gives you plenty of fiber, good fats, protein, textures and flavors. You and your guests will come away feeling completely satisfied and very taken care of!